Once upon a time, not so very long go, there were just two TV channels and neither of them went 24 hours a day. To signal the end of the day’s transmission, TVNZ (or whichever of its predecessors was in existence then) played the Goodnight Kiwi settling down for the night to the tune of Hine E Hine. The excitement with which the announcement TVNZ is bringing the Kiwi and his cat back to our screens has been greeted is a sign of the affection in which they’re held. However, the sad state of current programming means there’s little if anything worth watching to keep us up to see them. If you can’t wait to see the updated version, Youtube has the original. As the designated driver for our party of five I took a precautionary approach to alcohol at Friday’s wedding. I accepted a glass of bubbles when we arrived at the reception and nursed it over the next couple of hours until we sat down for dinner. The glass was still half full but I abandoned it in favour of a still white for the toasts and drank about half of that with the meal. After just two half glasses of wine over several hours, accompanied by food, I should still have been in full control, but that didn’t stop me tripping over en route to the dance floor. I fell on my left hand and am now sporting a compression bandage, a sling and relief I hadn’t drunk more because if I can do this much damage on two half glasses, I hate to think of the mess I’d be in had I emptied them. If there’s such a thing as genetic memory, it kicked in when we got to Scotland eight years ago. It wasn’t a feeling of coming home, that’s definitely New Zealand, but there was a sense of familiarity and recognition. The prosaic explanation for this could be similarities in the landscape which made me realise why the Scots felt at home in the southern South Island. But the romantic in me put the sense of connection down to the knowledge that this was the land from which my forbears came. My mother’s grandfather and all her great grandparents were Scottish. My father was born and brought up there and although he moved to New Zealand in his late 20s and spent nearly three quarters of his life here and loved the land he chose, he also retained a close affinity to the land of his birth. In many ways he became more Scottish as he aged. The kilt which was worn only when he went to Scottish Country Dancing when my brother and I were children, became a staple part of his wardrobe and his clothing of choice for semi formal and formal occasions. Even now, nearly nine years after his death I meet people who tell me they remember Charlie in his kilt, greeting them at the church door on Sundays or addressing the haggis on Burns night. For all the great inventions and distinguished people that have come out of Scotland, St Andrew’s Day doesn’t get the recognition that St Patrick’s Day does. While I’m quite happy that it hasn’t been commercialised my tarten genes called for a post in recognition of Scotland’s patron saint. McMurphy fell 12 storeys, hitting the pavement like a paper bag filled with vegetable soup. Long separated by cruel fate, the star-crossed lovers raced across the grassy field toward each other like two freight trains, one having left York at 6:36 pm travelling at 55 mph, the other from Peterborough at 4.19pm at a speed of 35 mph. “Oh Jason, take me!” she panted, her breasts heaving like a student on a 31p a pint night. He was as lame as a duck. Not the metaphorical duck either, but a real duck that was actually lame. Maybe from stepping on a landmine or something. Her artistic sense was exquisitely refined, like someone who can tell butter from “I Can’t Believe It’s Not Butter”. The knife was as sharp as the tone used by Glenda Jackson MP in her first several points of parliamentary procedure made to Robin Cook MP, Leader of the House of Commons, in the House Judiciary hearings on the suspension of Keith Vaz MP. The revelation that his marriage of 30 years had disintegrated because of his wife’s infidelity came as a rude shock, like a surcharge at a formerly surcharge-free cash point. He was deeply in love. When she spoke he thought he heard bells, as if she were a dustcart reversing. The manipulation of public opinion through sophisticated public relations techniques poses a threat to New Zealand democracy, Wellington investigative journalist Nicky Hager warns. Mr Hager gave a keynote lecture, titled “Imagining a world where the PR people had won”, at the Sociological Association of Aotearoa New Zealand conference at the University of Otago. Public relations methods had long been used to influence public opinion, but in recent years there had been “a really huge and important change” which now posed “a threat to democracy”, he said in an interview. I don’t necessarily disagree with his view, especially given the blow out in communications staff in the public service. But there is an antidote to the PR poison and that’s free and intelligent media which delves beyond press releases. And isn’t there more than a little of the pot calling the kettle black in his proclamation when he wrote a whole book using selected emails to prove his foregone conclusion? John Ansell showed how he operates here and Hager’s response is here. This Friday’s poem was chosen because as the earlier post tells, today friends are being married and it will be the first of five weddings we’re attending in three different countries over the next couple of months. Wedding Song by Jenny Bornholdt is from My Heart Goes Swimming edited by Jenny Bornholdt and Gregory O’Brien, published by Godwit. I work in the OSH industry and one of the most frustrating things is seeing a seatbelt done up to activate the sensor, but operators sit on top of it. Here is a youtube link that shows a forklift fatality. Not gory at all but a seatbelt would have stopped him being thrown out the back and crushed to death. seatbelts save lives. Anyone who thinks that they are a nuisance or inconvenient or Fred would have died if he had worn his etc. etc. should ask themselves whether their widow would have preferred they wore a seatbelt. I agree, my earlier post wasn’t arguing seatbelts shouldn’t be worn, it was to say it’s difficult to convince people to use them (and other safety equipment). 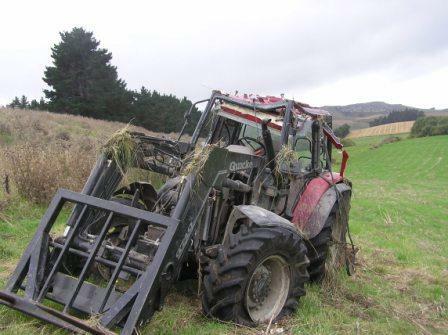 The photo below is a tractor after it rolled five times and finished on its wheels, facing the opposite direction from which it had started. It had a seatbelt but the driver wasn’t wearing it. At one stage he remembers his legs going outside the cab and thought “this is how people die”. We think he then hauled himself back in by the steering wheel. He ended up with a bad gash in the head (possibly done by fire extinguisher which hadn’t been secured) and fractured five pedicles on his spine. He’s made a full recovery but could very easily have died. Was listening to newstalkzb’s Danny Watson discussing this yesterday. A guy rang up and talked about ’springbelt’ – a belt for tractors which is in the way unless you do it up. He claimed it is positioned so that it is quick and easy to do up. May be interesting to get on a trial see if it is convenient or just adds frustration to the ” in and out of the cab ” type jobs you mentioned. If it works that could be the answer because no matter how often people are warned of the dangers, it’s too easy when you’re busy and not aware of any dangers, to ignore simple precautions. You are currently browsing the Homepaddock blog archives for November, 2008.